CHICAGO (WLS) -- A 2-year-old boy was fatally struck over the weekend in Chicago's Jefferson Park neighborhood, police said. 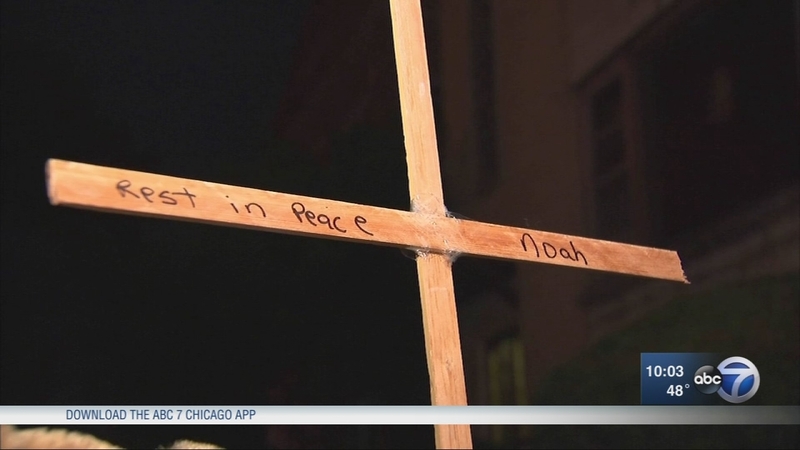 The Cook County Medical Examiner ruled Noah Katz's death an accident Tuesday. Authorities said he died of craniocerebral injuries. Katz was crossing the street with his mom in the 4700-block of North Central Avenue at about 4:11 p.m. Sunday when a driver traveling west on Giddings Road turned south onto Central Avenue and hit him, police said. The driver was cited Monday for failure to stop at a stop sign, failure to reduce speed and failure to yield to a pedestrian, police said. Neighbors said the van dragged the boy several feet before coming to a stop and that another driver had to get out of their car to force the van to stay. "A gentleman who was a witness was standing by my house. He said that he saw the guy coming up this way and turning left and he dragged the little boy a little bit and he seemed like he was taking off. He stopped and got out of his car and yelled, 'You need to stop,'" said Sharon Sands, a neighbor. A nurse who happened to be nearby ran to help the boy and perform CPR. He was taken to Lutheran General Hospital in Park Ridge, where he was pronounced dead. His 39-year-old mother suffered minor injuries. One man, a father of two, who witnessed the incident said he is moving out of the neighborhood. He said what he witnessed was too much and won't walk with his boys there anymore. Traffic on Central is constant and, residents say, fast. One resident said they had seen people driving around 50 mph on that street. Residents have pushed for safer places for people to cross, and 45th Ward Alderman John Arena's office confirmed money has been approved for the work, but the city hasn't started yet. "Well, it's frustrating. This has been going on for years. I grew up on this block, it's the same house since I was 5," said Warren Huck. Arena's office said roughly $80,000 will fund the addition of pedestrian bump outs. The Chicago Department of Transportation will complete the project, but an exact completion date is still unknown. Arena's office is optimistic, targeting Spring 2017. Several pedestrian bump outs are installed along Lawrence Avenue in the 47th Ward. Traffic experts say they slow down traffic and make pedestrians more visible to drivers. Bump outs are green-lighted for Central Avenue just half a block from where Noah was killed.